At High Breeze, the decor is luxurious, the floor plan is luxurious, the outdoor space is luxurious… see a trend? You’re also a short drive from Barbados’ hot spots, if you ever want to leave this dream villa! Your family, friends, and guests will all love High Breeze. 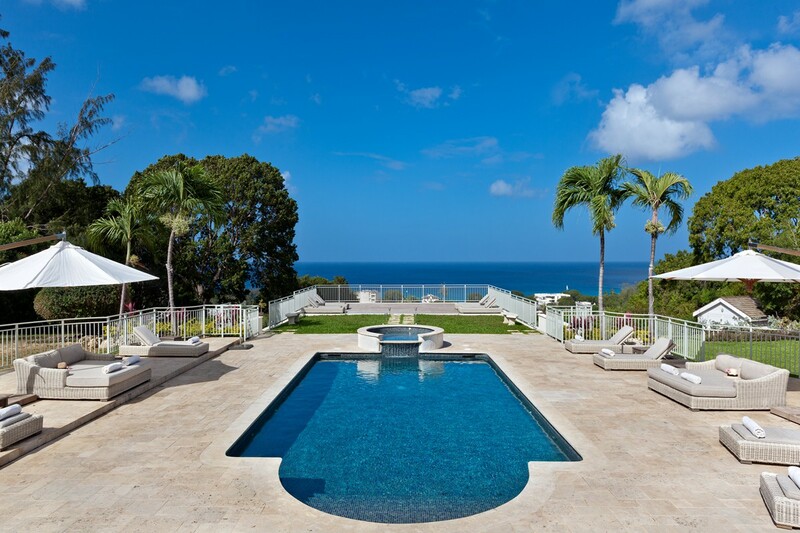 This five bedroom, five bath villa overlooks Barbados’ west coast on Holders Polo Ridge in St. James. High Breeze includes access to the Fairmont Royal Pavilion Beach Club, which provides beach chairs, umbrellas, exclusive restaurants, and bars. High Breeze’s expansive pool deck features several lounging spots and a large infinity pool. The deck seems to stretch on forever, with plush loungers on either side and Barbados’ lush jungle around the perimeter. Just above the pool deck, an additional seating area and bar stands as a conversation spot or reading nook. Around the corner, the outdoor dining pavilion seats 14 with ocean views, and the dining nook across the garden seats 10. The stunning foyer and formal living room features ample seating and luxurious Old World decor, customary to Barbados. The large fitness room features a range of equipment for any workout, with an ocean view. The fully equipped kitchen features a long island and ample cabinet/counter space. Three bedrooms lie in the main house, each with a walk in closet, king bed, ensuite bath, and large windows. The cottage features two bedrooms with ensuite baths, queen beds, and a private outdoor patio with a garden view. This villa is optimally located, within a 5 minute drive of Holetown’s shopping and restaurants, and a 10 minute drive from Limegrove’s luxurious stores and movie theaters. This luxurious villa has every amenity a guest could ask for!